Today we did more coating tests. As usual, we stuck with the same load and only varied the coating and the lube. 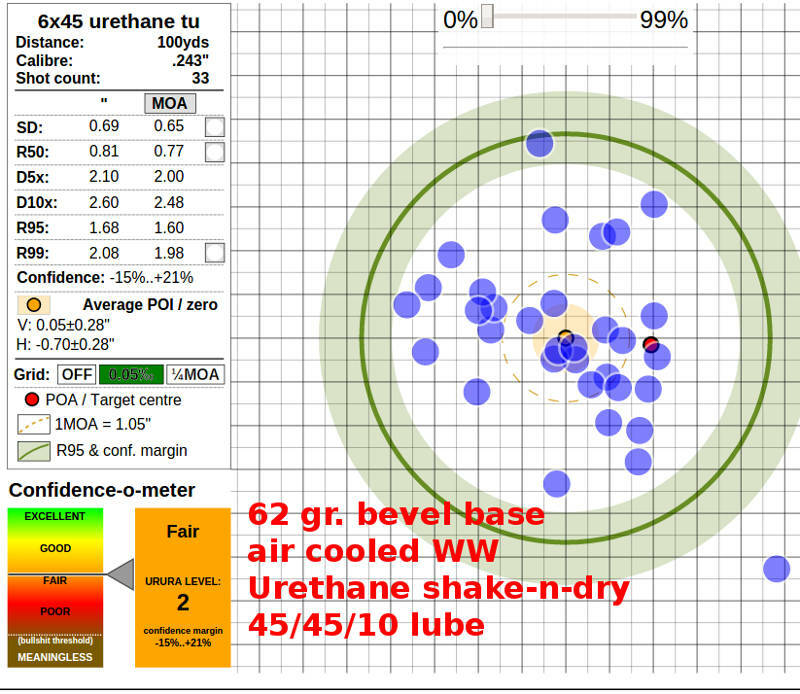 First up, air cooled WW with polycrylic shake & dry, but no lube. -- no detectable leading, but a tight fitting patch showed some shiny gunk -- I'm guessing it was polycrylic fouling? Next, oven treated WW with polycrylic shake & dry, but no lube. Notice that with both alloys, the second group was worse than the first group. I suspect accuracy was deteriorating as more shots were fouled due to fouling. 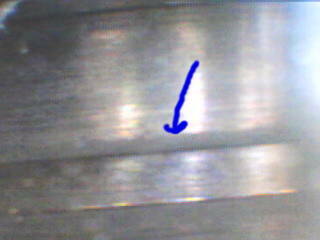 Not lead fouling, because there wasn't any, but due to the polycrylic itself fouling. Anyway, to my surprise, the air-cooled bullet coated bullet was more accurate than the hard coated bullet. I have no explanation. These coated bullets are forcing me to rethink everything I thought I knew about cast bullets. Next up, air cooled WW with no coating, just ordinary HVR lube. This was a control to compare to the coated air-cooled bullet. Definitely inferior to the polycrylic coated air-cooled bullet. 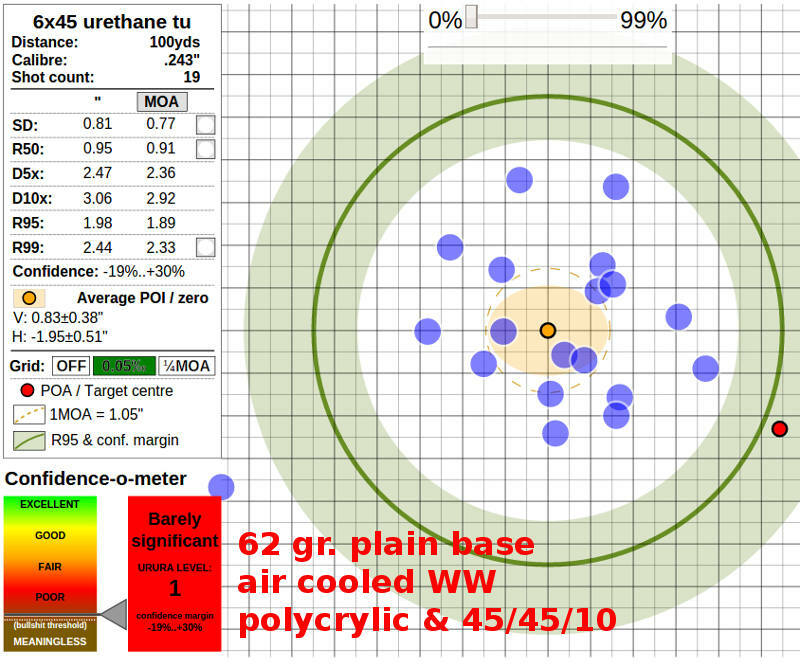 -- air-cooled WW outshot hardened WW, using polycrylic and no lube. -- polycrylic coated air-cooled outshot non-coated air cooled. -- polycrylic may cause polycrylic fouling if there is no lube. 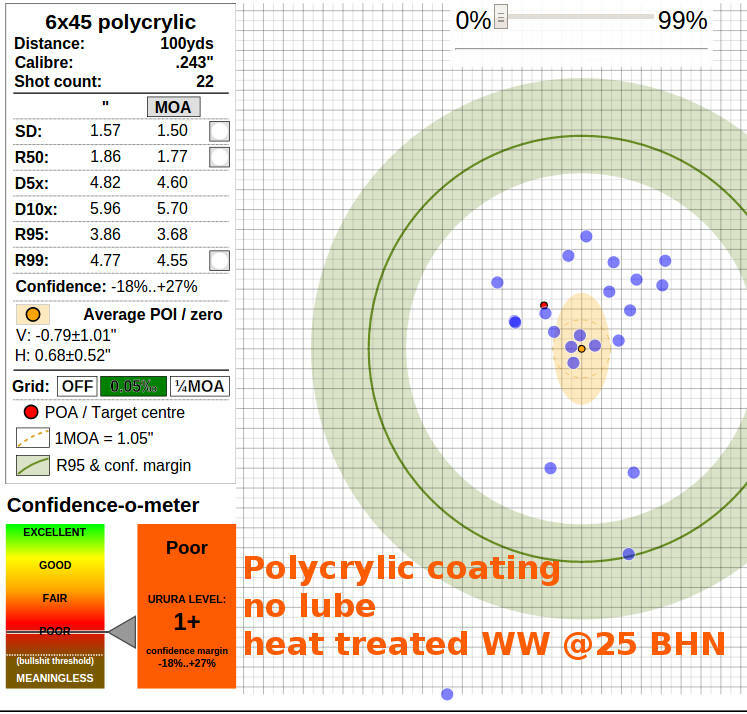 -- polycrylic may be an "OK" coating, but it may benefit from lube. -- hard bullets have less velocity variation than soft bullets, again probably due to increased engraving resistance which helps the powder burn. -- I'm still favoring polycrylic or urethane shake & dry as my favorite coating, even though the polycrylic seems to foul if used without lube. Rustoleum enamel is out because it did not stick well. Rattle can epoxy paint shot well enough but the adhesion was marginal. Rattle can urethane shot OK but it costs more than a shake & dry coating. Hi-Tek shot well but is not compatible with heat treating. -- otherwise I am out of coatings to try and ready to move on to higher velocities. How fast can I push coated plain base bullets before they go wild ? 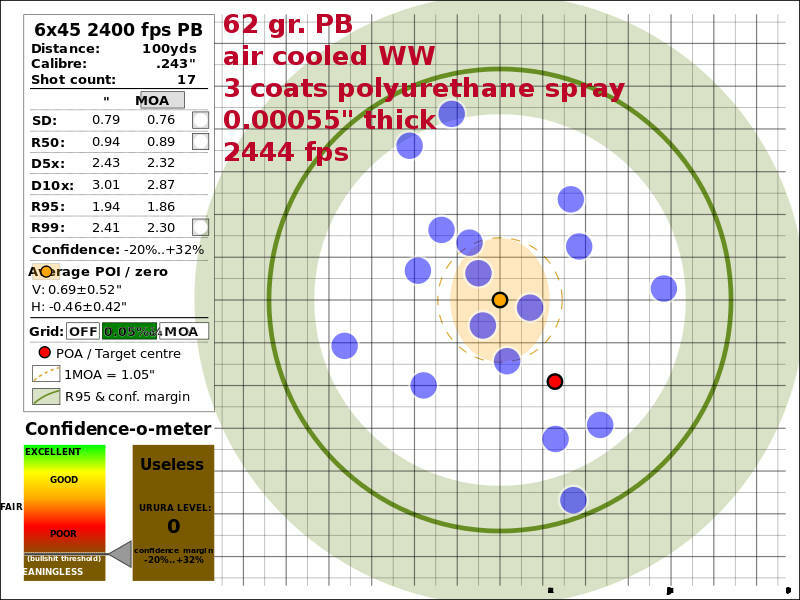 -- is there any benefit to coating gas check bullets at high velocities ? -- long term, I'll probably revisit powder coating if and when I get a spray gun. -- long term, I would like to try a shake & dry with 2 part epoxy paint, if I can find some that cures OK at room temperature. Today's target. Not a whole lot different than the other coated loads I've tested. 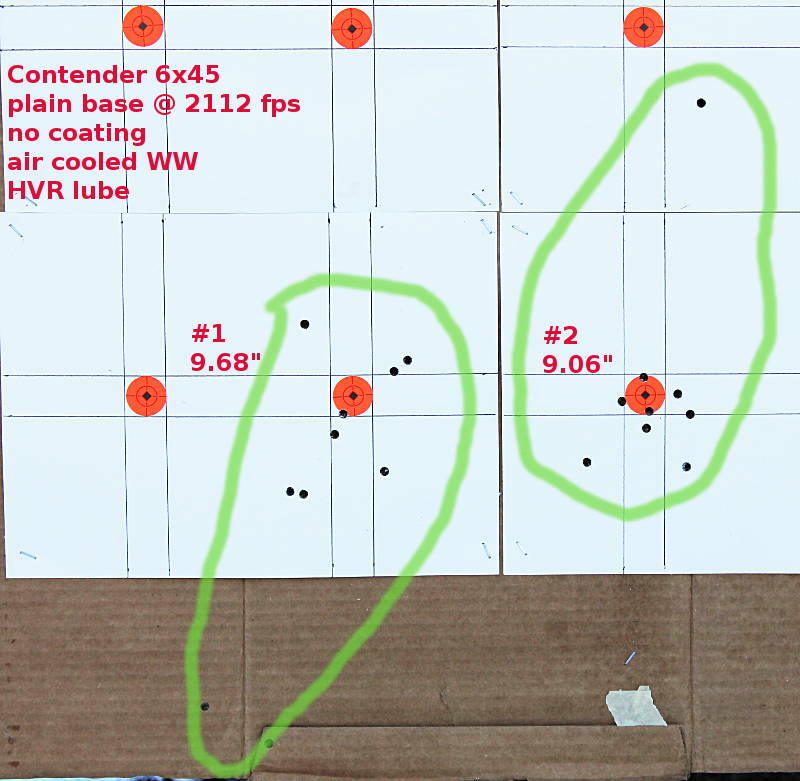 However today's tumblelubed bullets maintained their accuracy as more shots were fired, unlike last weeks un-lubed bullets that seemed to throw more fliers as more shots were fired. 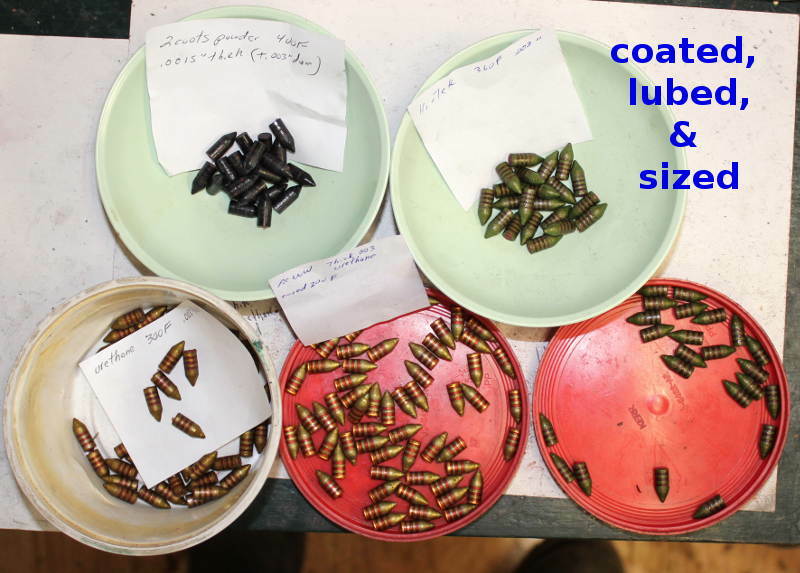 -- I do believe that these coated bullets benefit from a lube to reduce polymer fouling. -- compared to real lube, tumblelube seems to have more velocity variation. 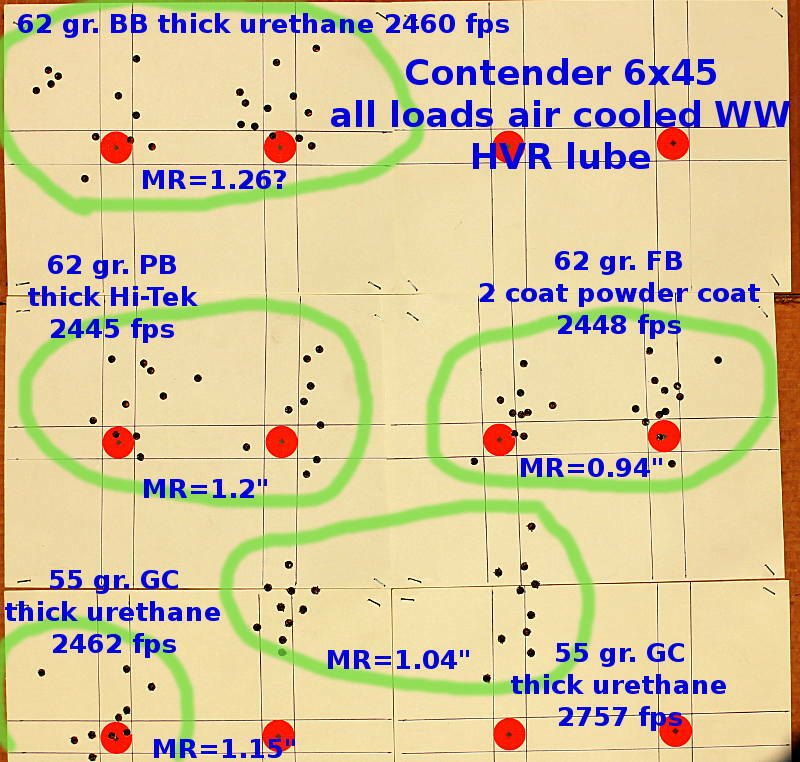 -- air-cooled WW seems to shoot just as well as hard bullets as long as a lube is used in addition to the coating. -- I think for the time being I will standardize on urethane shake-n-dry with some sort of lube. Urethane seems to work as well as anything I've tried so far, and it's essentially no cost to me because I always have a partial can of urethane on hand. -- let's try increasing the velocity and see how fast I can push coated air-cooled plain base. Today we ramped up the velocity to see if we could make coated plain base bullets fail. First up, urethane shake-n-dry at 2189 fps. 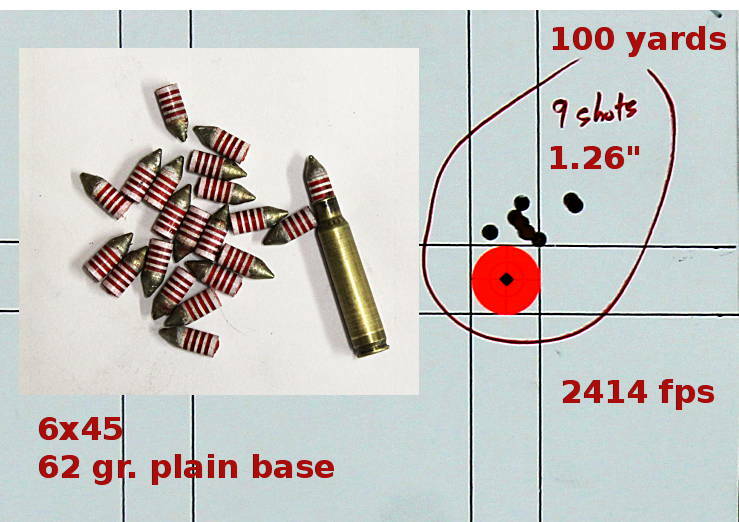 -- sized 0.246" x 0.2415"
-- 9 shots in 2" with a flier opening up to 9.5"
-- 10 shots in 15.5", definitely wild. -- yes Virginia, you can push coated bullets fast enough to make them fail. -- velocity of today's loads were 200 fps slower than expected, makes me wonder if they need a real lube to create a good gas seal ? -- Why did they fail? Coating melted through and allowed lead melting and gas cutting ? Soft bullets canting ? -- Would a harder alloy hold up in the 2366 fps load? A real lube? A different coating? -- no fouling to complain about, more on that in the next post. This was the first time I'd ever bore scoped this 6x45 barrel. Because the Lyman borecam is hypersensitive to dirt, it's necessary to clean the unburnt powder, etc. out of the barrel before inserting the borecam. So I pushed a single dry patch through before inserting the borescope. The barrel was mostly clean after shooting 40+ coated bullets today, with only some light grey streaks about 6" past the breach. Before and after this stretch was pretty clean. This photo shows the worst of it and it's not that bad, just light stuff that usually cleans out with a wet patch. 13" past the breach, no fouling, but a tiny bit of chatter on the lands. This was the worst chatter I found, most of this Shilen barrel is smooth. It has been firelapped 10 shots if I remember correctly. After looking at this I might shoot 5 or 10 more firelapping rounds but honestly it has never fouled enough to complain since the first firelapping about so if it ain't broke why fix it? 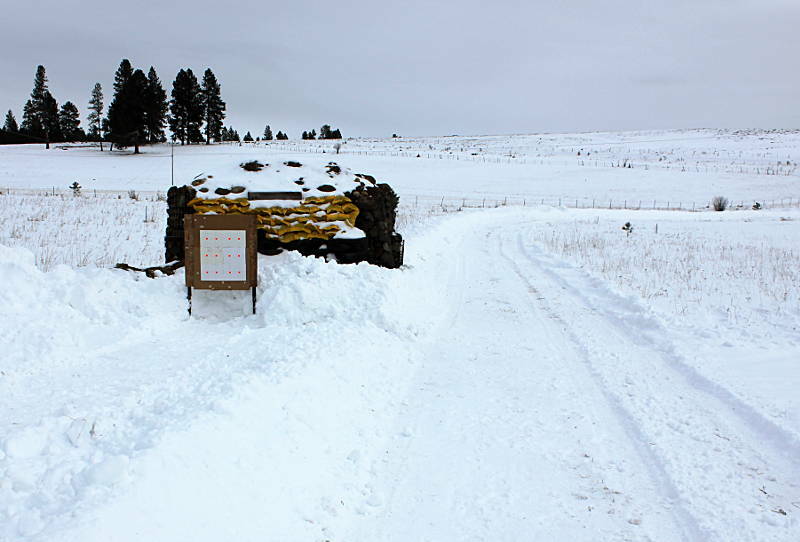 Shooting has been on hold recently due to 50 mph winds, but the weather finally calmed down and I shoveled out a path to the shooting range. It was 15 degrees outside but 65 in the shooting shack. 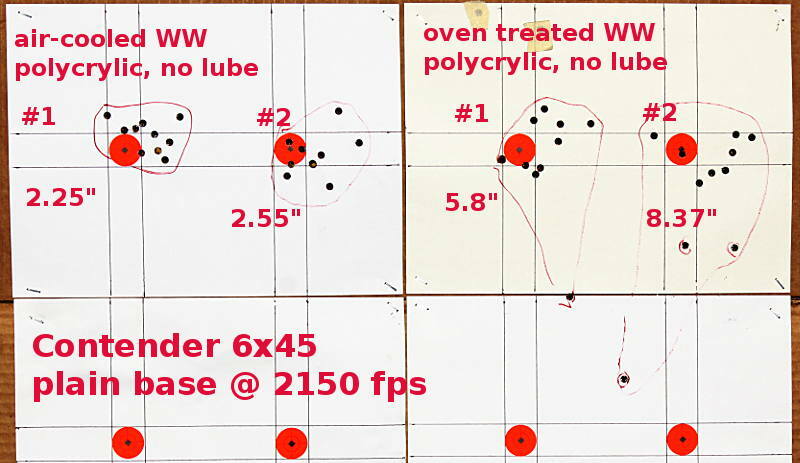 When I left off, my coated & tumble lubed bullets were beginning to shoot wild at 2300 - 2400 fps. Today's experiments used the same load as last time, tweaking the coating, lube, and BHN to see if I could shoot groups instead of patterns. First up, powder coated using the dry shake-with-plastic-BB's method. I'm gradually getting better at the technique and they ended up with about 85% coverage after 1 coat, so I called that good. Then they were lubed with HVR. 1 coat of shake-n-dry polyurethane followed by 2 coats VHT rattle can epoxy, cured at 300F, HVR lube, otherwise the same load and same 11 BHN. Coincidentally on this Christmas day the bullets look like Christmas Candy Canes! I'll be the first to say that the accuracy numbers should be viewed with skepticism until enough shots have been fired to "prove" that the results are repeatable. BTW the CCI #41 primers that I have been using have been averaging 10%+ duds. They seem to be getting a good smack so I suspect the fault lies with the primer not the gun. I purchased them during the height of the primer shortage when you had to take whatever you could find. Dunno if the crappy primers are hurting accuracy but anyway the duds are why some groups were only 8 or 9 shots rather than 10 shots. All of today's loads shot very clean, more on that in the next post. -- increase powder charge until it shoots wild. 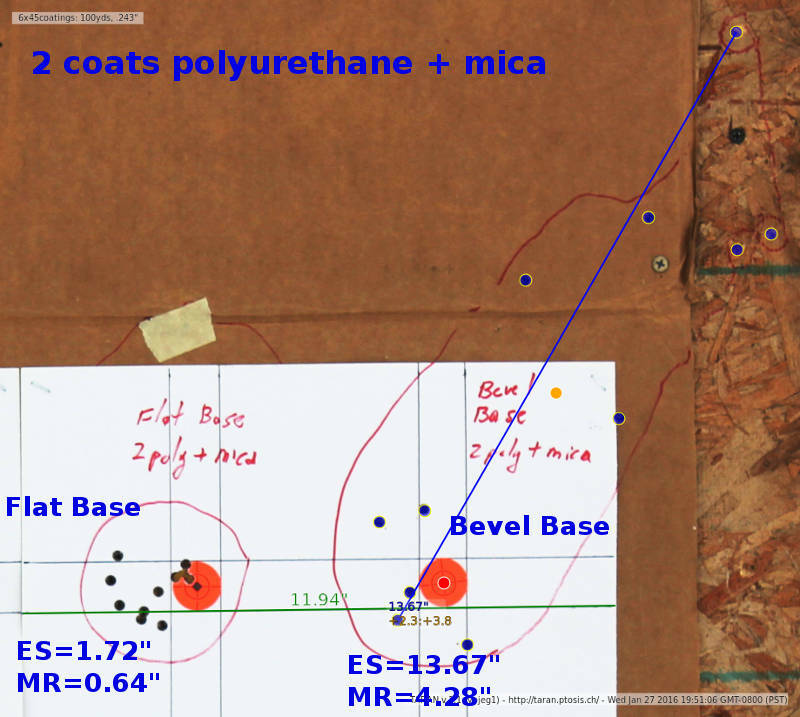 -- is there any benefit to coating gas checked bullets ? I think this is after powder coat plus HVR but can't swear to it. At any rate it was squeaky clean. This is the closest thing to fouling that I saw, and only toward the muzzle. I think this was after the urethane + HVR loads but can't swear to it. See the little bit of grey just above the land? No fouling here but I did find some light pitting in the barrel. Only in certain random spots toward the muzzle. I dunno if it came from the factory with pitting or if it corroded after shooting? In any event my new standard procedure for all guns is clean the barrel at the end of the shooting session whether it needs it or not, and finish with a patch wetted with Ed's Red..
Today we retested the same load that we shot last week, except with thicker coatings, just to see if the coating thickness makes any difference. 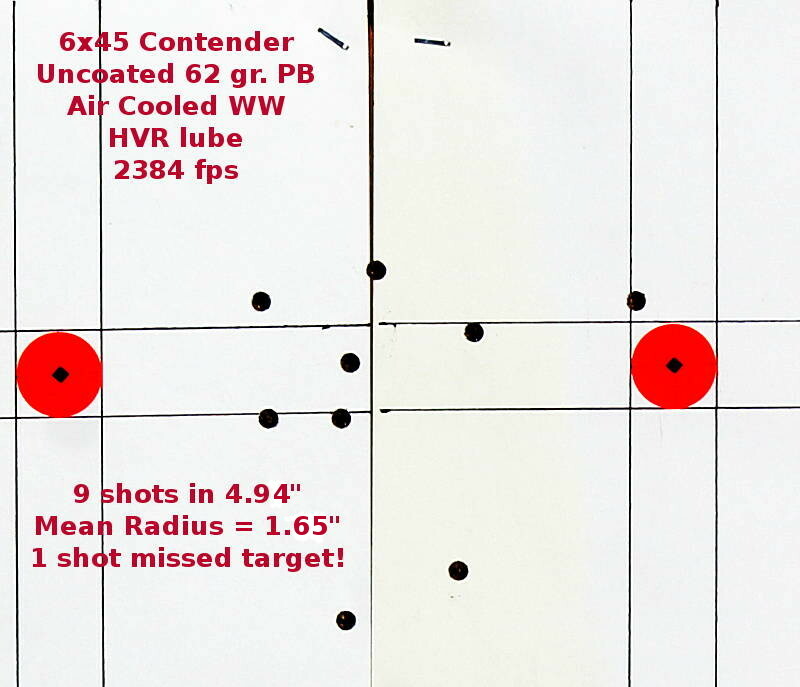 Unless otherwise stated, all of today's loads used air-cooled wheelweight, 26 gr. WW760, CCI #41 primers, and COL set right at the jam point. Last week I used a single layer of powder coat, so this week I used 2 layers. Dry shake with BB's, baked at 400F. 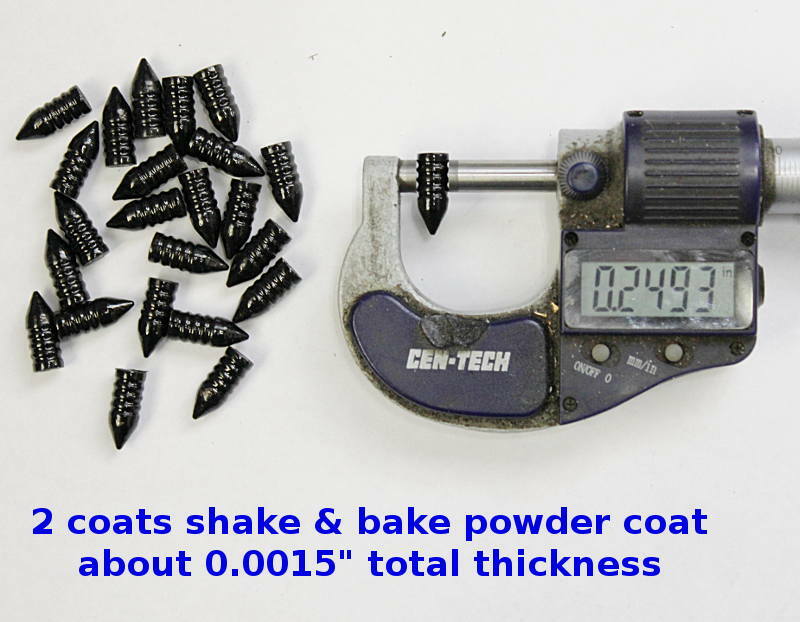 The bullets began life at 0.246" so the double powder coat was about 0.0015" thick. 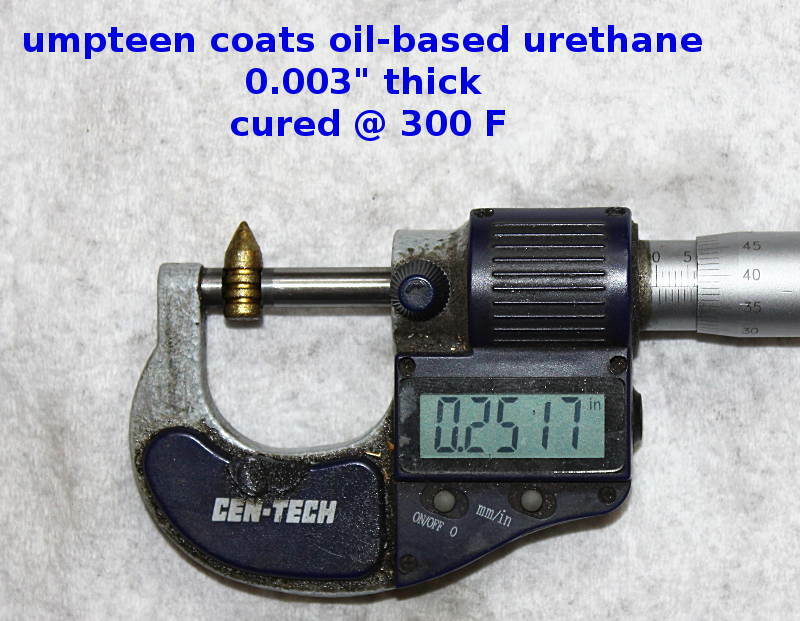 Umpteen coats of Hi-Tek until it was 0.003" thick. Instructions say bake at 385 - 400 F, but I've found that it's best to err on the cool side because overheating seems to make the coating brittle and flakey, so I baked at 360 F after each coat. Umpteen coats of urethane, shake & dry method, and oven cured. In theory oven curing should make it harder and tougher but it's anybody's guess what the correct curing temperature is. 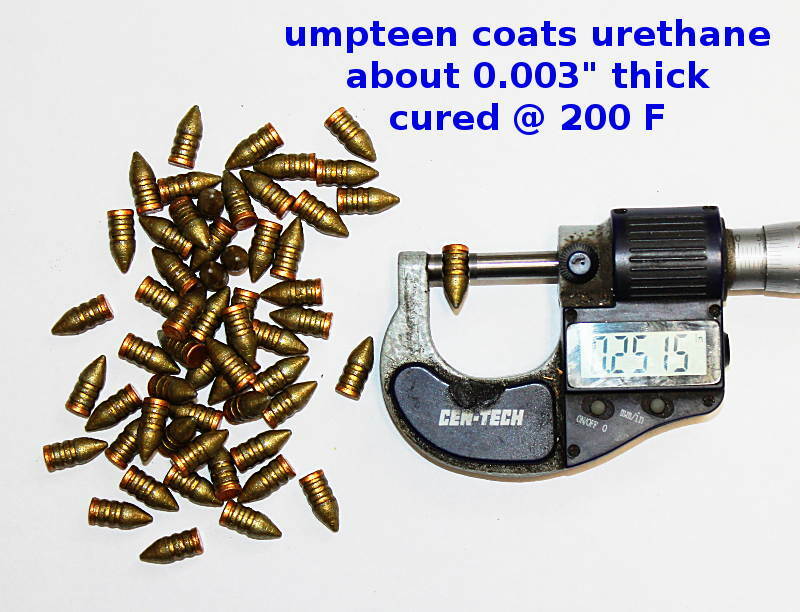 Also umpteen coats of urethane on some gas check bullets. The urethane turns amber after oven curing. 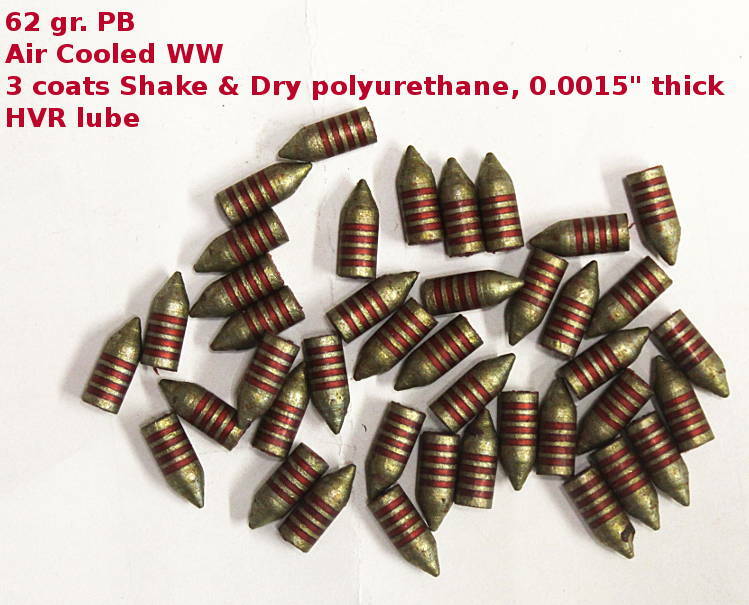 The coated bullets were lubed with HVR, nose sized just enough to make the front band 0.242", then push-thru sized 0.246". 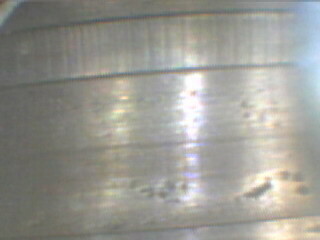 One of my beefs with Hi-Tek is that adhesion is marginal. 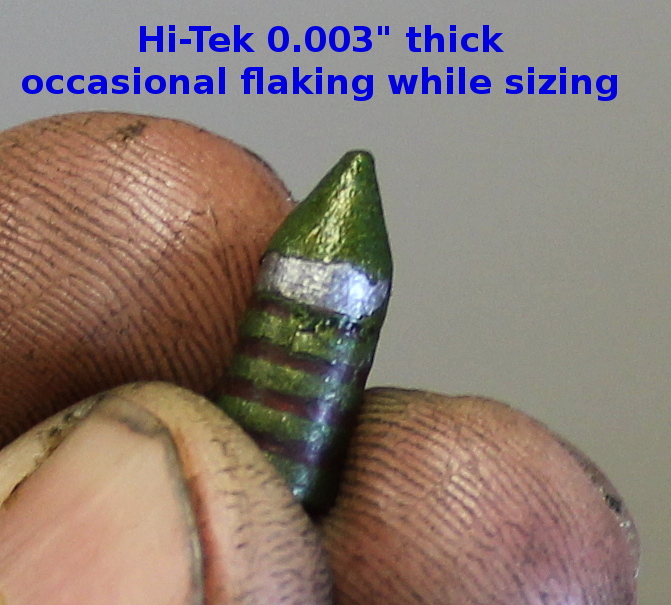 A couple of the Hi-Tek bullets flaked during the sizing process. Today's target. 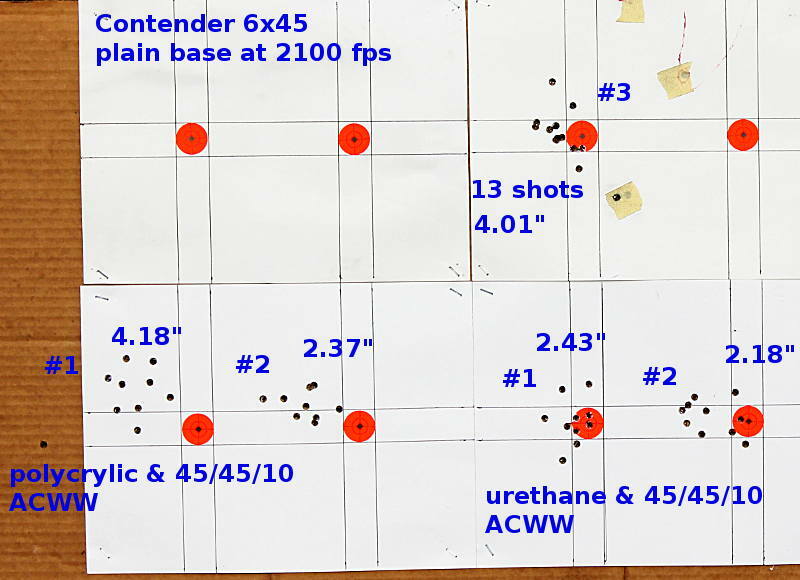 The good news is that all the coated loads shot groups, not wild patterns, and the groups were pretty consistent. The bad news is that they were lousy groups. It's fair to say that the extra thick coatings were a flop. Oh well, at least that question has been answered and we can move on to other questions about coatings. -- the thick coats hurt rather than helped. 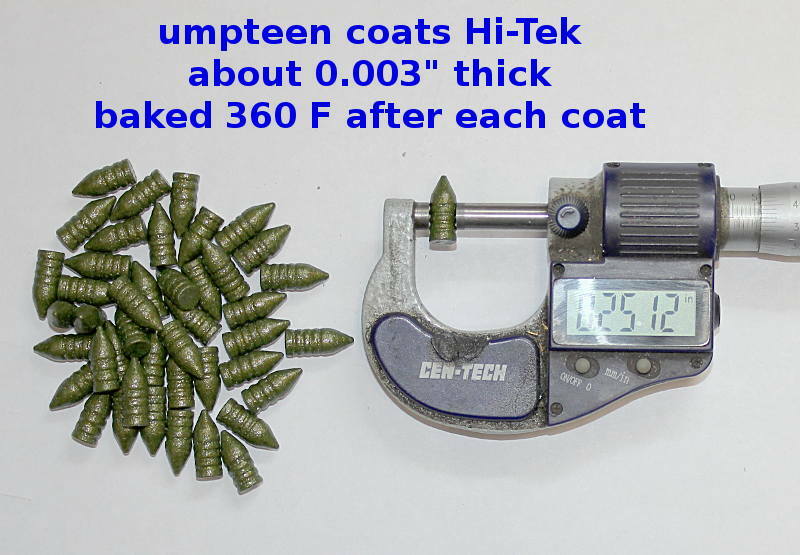 My best guess is that 1) a thin coat suffices to prevent melting and gas cutting and 2) the thicker the coat, more imbalanced the bullet is likely to become after sizing. -- not much difference between 1-coat & 2-coat powder coat. 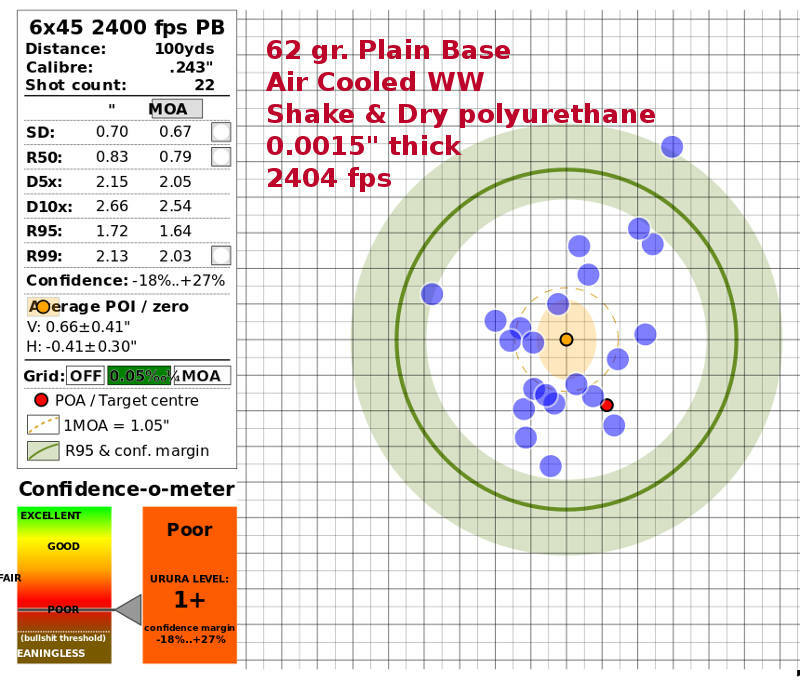 -- not sure what to make of the 2757 fps gas check loads, since this was the first time I'd tried coated GC and the first time I'd tried an air-cooled bullet at 2700+ in this gun. I want to repeat the GC test with a thin coat and hard bullet. -- once again I give up on Hi-Tek. It's "OK" but not superior in any way, and adhesion is marginal. -- once again I am underwhelmed with powder coat. It's OK but not superior in any way. 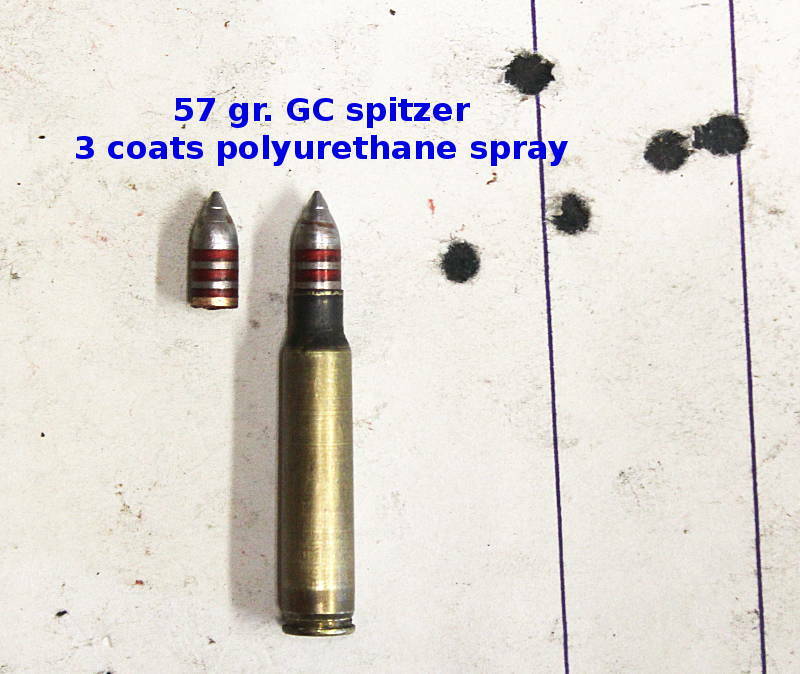 -- note that the coated GC bullet did not shoot any better than coated PB when loaded to 2400 fps. It may be that since the coating prevents melting and gas cutting that the GC serves no purpose. More testing required to know for sure. 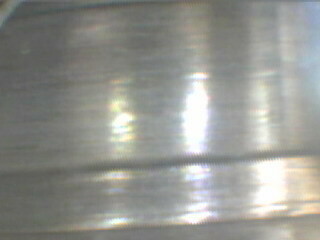 -- as time and money allows I would like to try more coatings, i.e. spar urethane because it is supposed to be more flexible, water based urethane, and 2-part epoxy automotive paints. Next post will show borecam pics for today's loads. 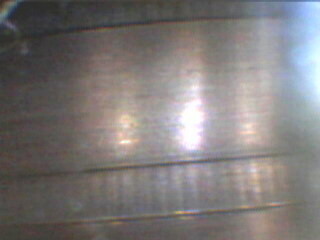 After thick Hi-Tek & HVR @ 2445 fps. 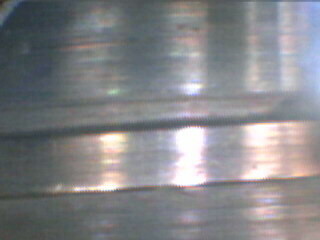 Just a light streak of color in the corner of the groove. After Powder Coat & HVR @ 2448 fps. 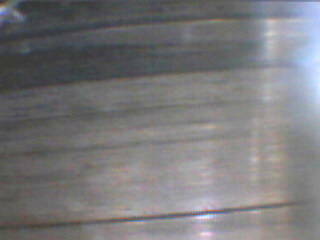 Just a little black color in the corner of the groove in certain areas. I suspect the black color is polymer fouling, not lead fouling. After thick Urethane & HVR @ 2460 fps. Clean as a whistle but did notice these "spots" just past the throat. I don't normally check this area carefully because it is not prone to foul, so the spots may have been there before and I did not notice them. Further down the barrel after thick Urethane & HVR @ 2460 fps, clean as a whistle. After thick Urethane & HVR & GC @ 2757, clean as a whistle, but even after scrubbing and JB'ing, these spots just ahead of the throat were still there. I haven't figured out what the spots are -- looks like discoloration, not fouling? So the good news is that coating & HVR pretty much eliminates fouling, not that this barrel ever fouled much with uncoated bullets, either. Last week's tests with thick coatings were a flop, so today we tested thin coatings. 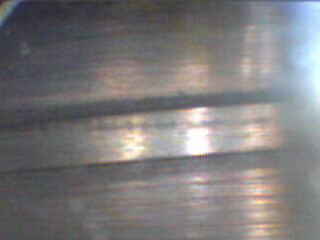 Unless otherwise stated all of today's loads used air-cooled wheelweight, 26 gr. 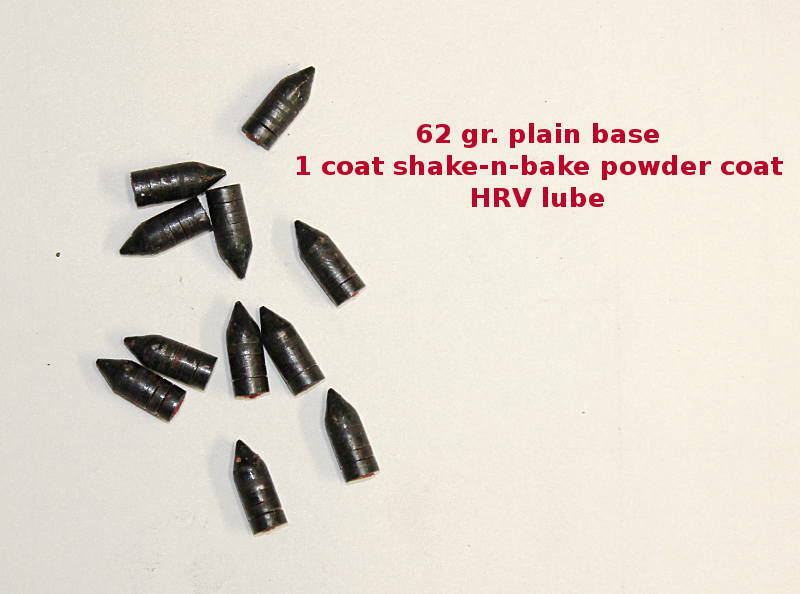 WW760 powder, CCI #41 primer, HVR lube, the 62 gr. 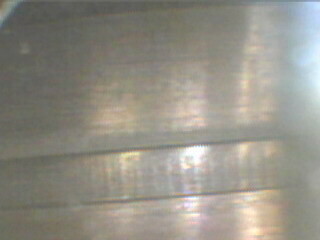 plain base sized 0.246" x 0.242", seated right at the contact point, and approximately 2400 fps. First up let's shoot some uncoated bullets at 2400 fps just as a reminder of why I'm experimenting with coatings. The first shot from the cold, clean barrel missed the target backer ! The next 9 shots actually performed better than I expected, though still lousy. There was no significant fouling after shooting the uncoated bullets. Fouling has yet to be a big problem in this barrel at any velocity. Next up, shake & bake polyurethane, 3 coats with a combined thickness of 0.0015" and an average out-of-roundness of 0.00081". The coating was oven cured at 300F, giving it the gold tint. Next up, polyurethane rattle can, 3 coats with a combined thickness 0.00055", and an average out-of-roundness of .00008" due to the coating. Oven cured at 200F. I expected the spray poly to be more accurate because the thickness is more even so the bullets should have less coating-induced imbalanced. 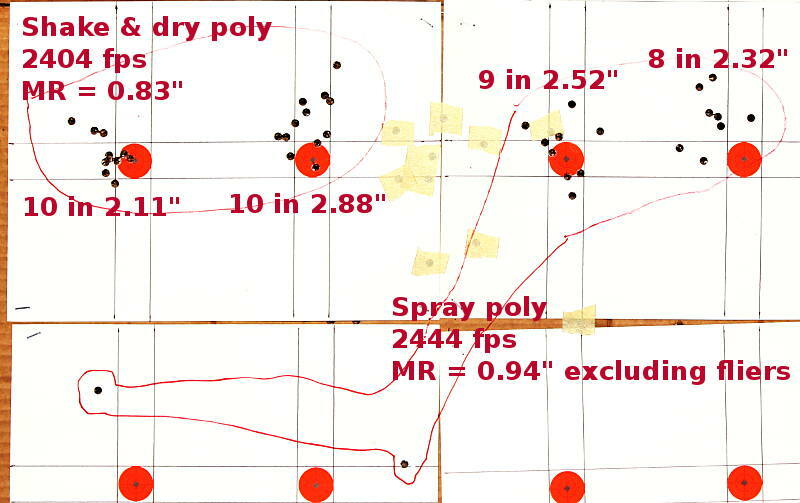 Yet there were 2 wild fliers, and even excluding the 2 wild fliers, spray poly was less accurate than shake & dry poly. Shake & Dry vs. Rattle Can target. Even if we ignore the 2 wild fliers -- and we shouldn't ignore them because something is definitely wrong when it's that wild -- the 0.00055" thick spray poly was less accurate than the 0.0015" thick Shake & Dry. I had a few shake & dry poly bullets left over so I wanted to see how fast I could push them before they failed: It was definitely unhappy by the time it reached 2700 fps. 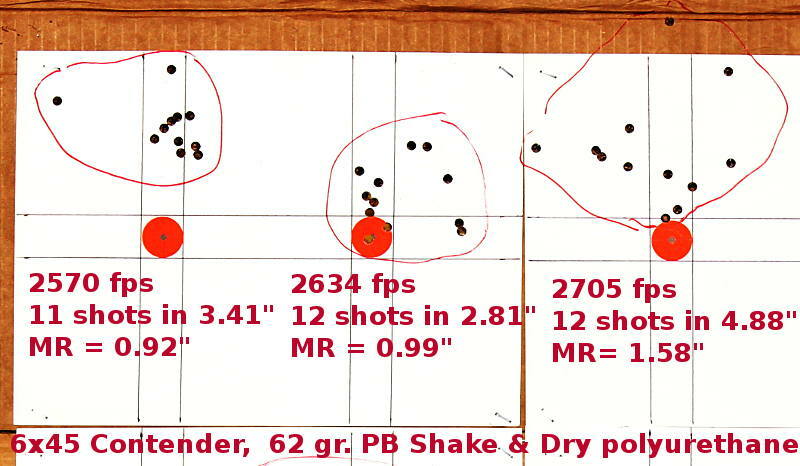 2570 fps was not too bad so that will be my new standard PB test load with 27.0 gr. WW760. 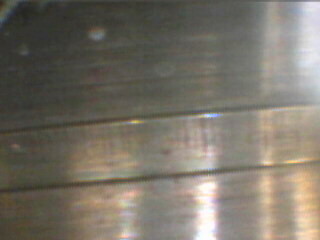 Bore cam after shooting the coated PB at 2705 fps. If you had looked at this barrel with your naked eye it would have looked clean as a whistle. 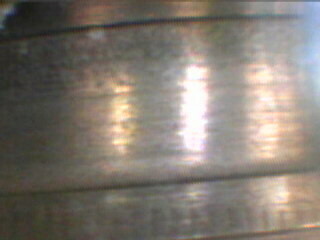 With the bore scope we can see a few dark streaks here, and in other places the barrel look slighly "hazy" instead of squeaky clean. -- 0.0015" thick shake & dry poly was more accurate than 0.00055" thick spray poly. -- What caused the wild fliers with spray poly? Did the thin coating burn through and allow melting and gas cutting? 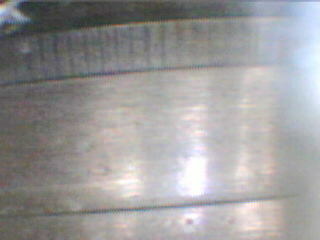 -- It seems like 0.0015" thickness is about optimal for polyurethane. Thicker hurts accuracy, perhaps due to imbalance? Thinner hurts accuracy, perhaps because the thin coat burns through? 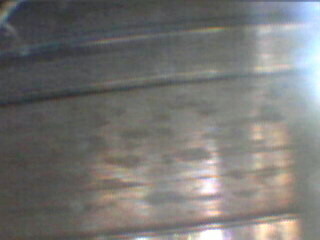 -- After all these tests, I'm still undecided as to which type of coating is best. -- in theory oven curing the coating will make it harder and tougher, if you get the temperature right. But I'm not sure what the ideal curing temperature is, so I'll keep tweaking that. -- I'm still not certain which alloy is optimal with coated bullets at a given velocity. Coated bullets seem to prefer a softer alloy than uncoated bullets, but I haven't done a lot of tests to fine tune the alloy for my coated applications. -- in general, a decent coating is definitely an improvement over no coating with plain base at 2400+ fps. -- I'm open minded about trying spray powder coat other than I'm not excited about buying a gun and making a fixture to hold the bullets nose-down. -- retest poly & epoxy at 2570 fps. It's possible the white epoxy has additives that make it more flame resistant than urethane alone. Some white paints have calcium carbonite or even ceramic powder added. 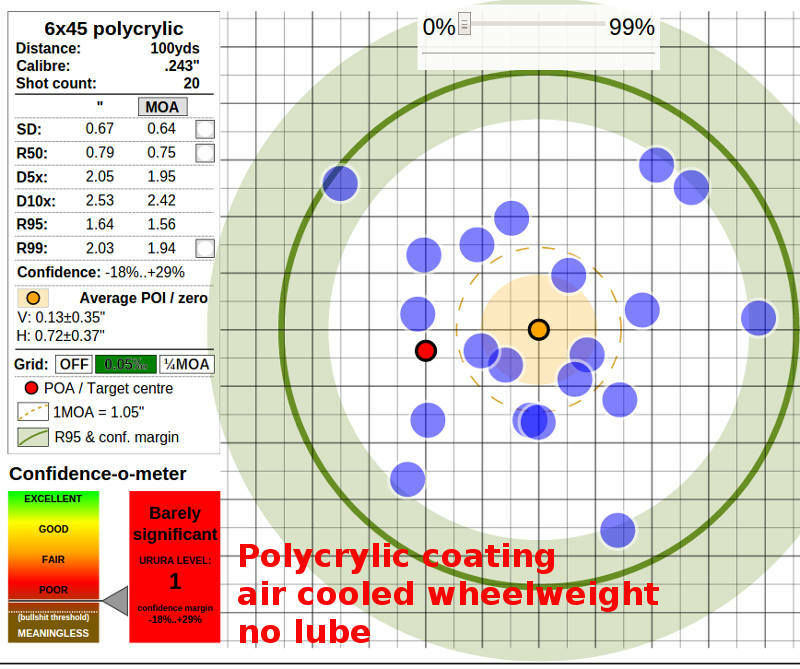 -- there are certainly other coatings that could be tested like 2-part automotive epoxies. All it takes is money. -- if I ever settle on a favorite coating, one of the next steps will be to test for optimal BHN. 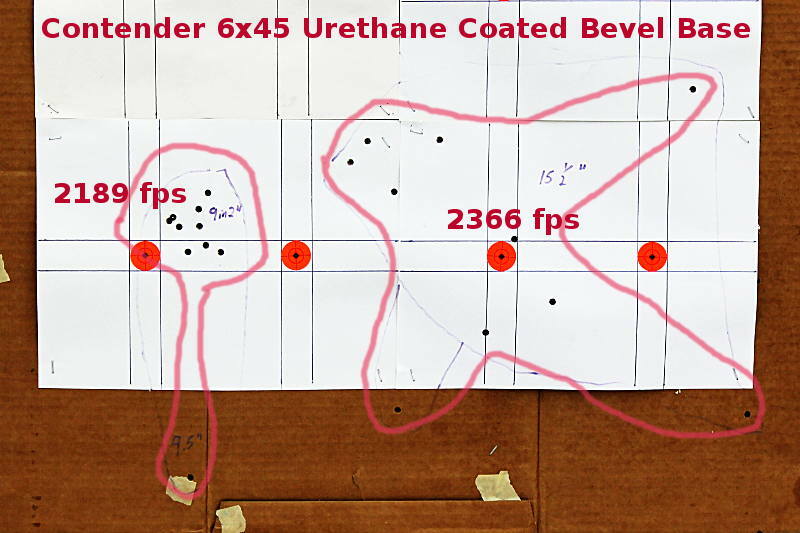 -- more tests with coated vs. uncoated GC bullets at 2700 fps. 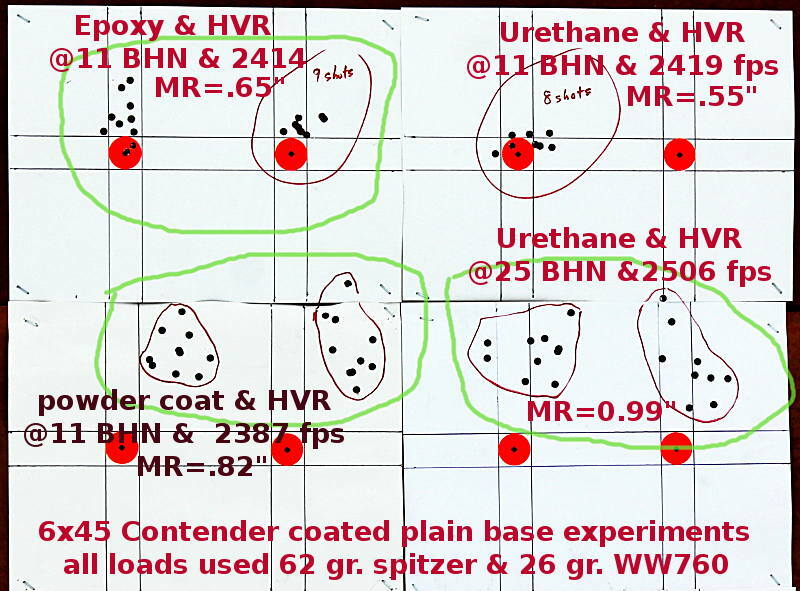 Do GC bullets even benefit from coatings ? More tests with minor tweaks to polyurethane coating. Unless otherwise stated, all of today's loads used 27 gr. 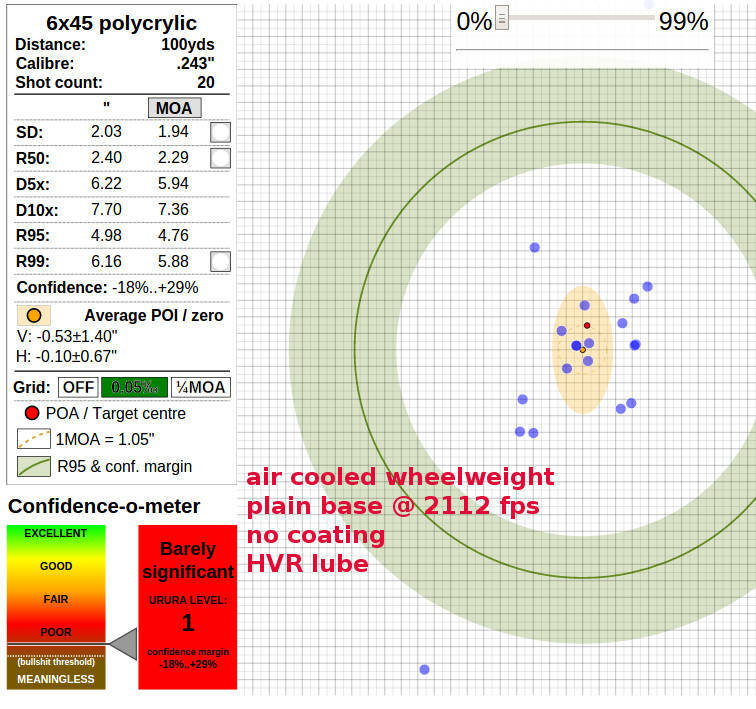 WW760, CCI#41, air cooled wheelweight, sized 0.242" x 0.246", lubed with HVR, and seated 0.015" away from contact. I had been seating right at contact, but tried 0.015" away because I'd been having so many dud primers. I wanted to rule out difficult chambering as the cause of the duds. Well, the duds continued so apparently I simply have a bad lot of primers, or else this Contender has a wimpy hammer spring. As usual, I was testing the coating not the load, so no attempt was made to optimize the load. To the contrary, this ~2570 fps load is right on the ragged edge of failing with these plain base bullets. I like to test on the ragged edge because it's more sensitive to small improvements or dis-improvements. 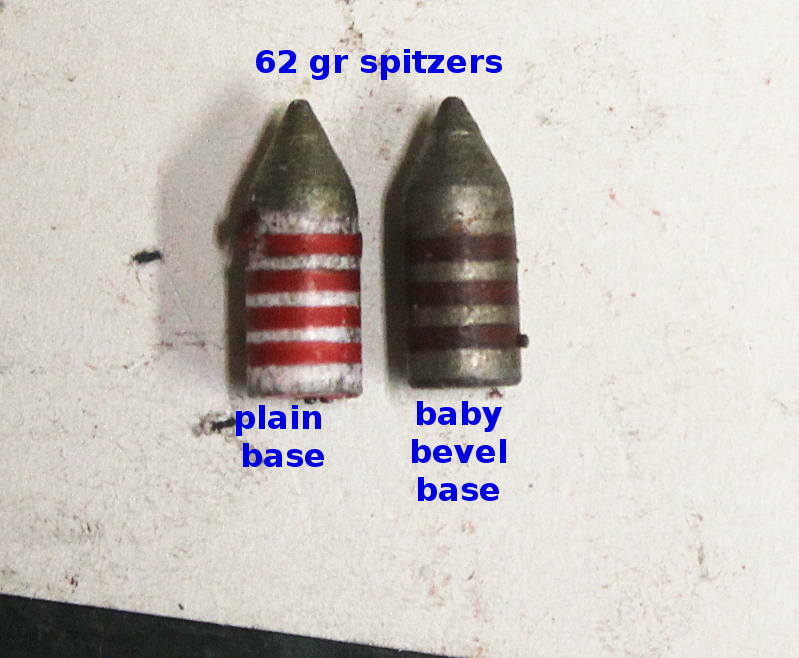 As a reminder, here's the two plain base bullets I'm working with. One is a flat base, the other has a diminutive bevel base. Usually they shoot with equal accuracy. Here's 2 coats shake-n-dry polyurethane with mica added. The idea behind the mica was not to reduce friction but to reflect heat. The flat base did OK but the bevel base shot wild. My guess is that the coating fails sooner on the bevel base because it is exposed to heat on both sides of the bevel, whereas a flat base is exposed to heat only on one side. In any event this suggests that the mica made the coating less effective. Here's the other targets. Last week I tried 3 coats of polyurethane, so this week I tried 2 coats, seeking the optimal thickness. Looks about the same to me, with a fair amount of variation from group to group, to be expected for a load that is on the ragged edge. 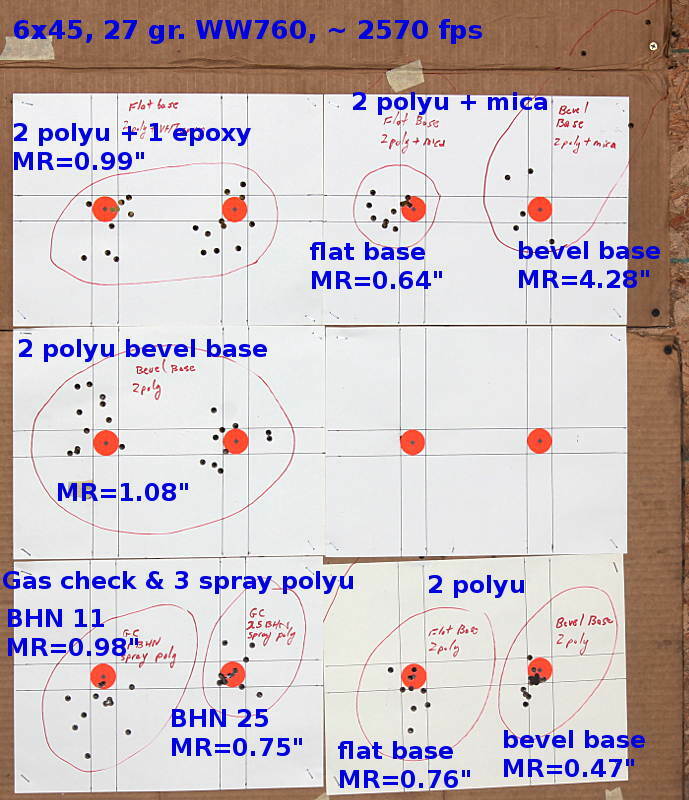 We also tested a few coated gas check bullets, though not enough to prove much. These received 3 coats spray polyurethane. I've since come to favor shake-n-dry polyurethane, but nonetheless these were on hand so we tried them. Note that the bullet has to be seated pretty far out because the throat is getting longer. It's about time to set this barrel back and give it a fresh throat. 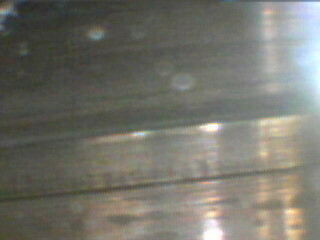 This is the bore after shooting the 2 coat polyu + 1 coat epoxy at 2532 fps. Just a little bit of color in the corner of the groove 6" to 10" from the breach, the rest of the barrel was pretty clean. All the other coatings looked exactly the same.